In teaching Modern philosophy, the absence of a comprehensive secondary text results in much class time spent on clarifying the ideas of the philosophers, leaving little room for philosophical discussion of wider issues. 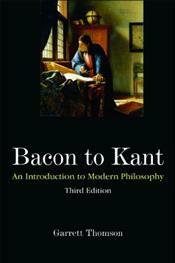 Bacon to Kant was developed as a response to the classroom need to offer undergraduate philosophy students an introduction to the claims and arguments of ten of the most-studied Rationalist, Empiricist, and Enlightenment-era philosophers.Descartes, Spinoza, Leibniz, Bacon, Hobbes, Locke, Berkeley, Hume, Rousseau, and Kant. The text is designed to be accessible without being philosophically naive. Thomson explains and analyzes central arguments in a readable and engaging style. Critical assessments of evolving views and arguments, contrasting interpretations of original texts, and thought-provoking questions designed to promote lively discussion help students connect the material to broader contemporary philosophical issues.